Criterion games, best known for their white-knuckle crash-fest Burnout series, has been tapped by EA for the next Need For Speed game coming this fall to pretty much everything, Wii included. Hot Pursuit, a kinda-sorta sequel/remake of the 1998 game of the same name (we're not sure exactly, it's a bit unclear), and Criterion's game is set to bring the focus back to the intense cops vs. racer chases that later NFS games drifted away from. Wii development will be handled by Exient, whose past titles include the DS version of Skate It and a plethora of handheld EA Sports games like FIFA and Madden. Hot Pursuit will launch on November 16 in North America and later that week in Europe. The full press release follows. LOS ANGELES, CALIFORNIA – June 14, 2010 – Criterion reinvents Need for SpeedTM Hot Pursuit for the connected generation. Criterion Games, a studio of Electronic Arts Inc. (NASDAQ: ERTS) announced today that the award-winning development team is making the latest installment in the renowned Need for Speed franchise. Inspired by the classic game of the same name, Criterion will reveal Need for Speed Hot Pursuit for the very first time today at the Electronic Entertainment Expo in Los Angeles. Launching in November 2010, Need for Speed Hot Pursuit brings the franchise back to its roots with intense cops vs. racer chases. Criterion also ups the ante with the introduction of an all-new online network called Need for Speed Autolog where players compare racing stats and automatically get personalized gameplay recommendations from their friends– a feature that is poised to transform online racing for the connected generation. Developed by Criterion Games, Need for Speed Hot Pursuit will be available on November 16, 2010 in North America and on November 18 and 19, 2010 in Europe on the Xbox 360® videogame and entertainment system, PlayStation®3 computer entertainment system and PC. 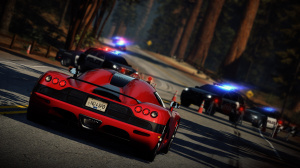 Need for Speed Hot Pursuit will also be available on the WiiTM and is being developed by Exient. PS3 game it is then. I don't care for watered-down ports or 'separately developed' for Wii. That hardly ever turns out well. @Pegasus I agree. PS3 for this one. N4S Hot Pursuit 2 was one of the best racing games of the last generation for the PS2. A welcome return to form for this series. I still frequently play NFS Hot Pursuit 2 on my GameCube. A great arcade racer, but this separately developed version kinda sounds iffy. This might have to be a 360 title for me. "Seperately developed for Wii" isn't always bad. For example, many people consider the Wii versions of "Sonic Unleashed" and "Star Wars: The Force Unleashed" to be the superior versions despite the inferior graphics. Exient seems to have mainly developed mobile games with a nascar game on ps2 being the only console title I know about they made. Not really a good sign that they are being tapped to develop the wii version then. Hope its good though. I've just begun playing Need for Speed Nitro in earnest before leaving on holiday and I'm quite pleased. It will be interesting to see how this stacks up, though I cannot imagine I'll want two Need for Speed games. A new Neep for Speed game...made by Criterion?! Thank the heavens. I will prolly have to buy the PC version if it's any good. I'm hoping for the best but I won't get my hopes up too high on this one. I had NFS Nitro for a while and quite enjoyed. I sold it on to finance other games though. If this is from the makers of Burnout, I'm definately radring it. I have had Burnouts 1 to 3 (still have 3 on PS2) in my time and enjoyed them all. I would hate to play this with a "normal" PS controller - Wii version all the way and everytime with racing games from now on! I'm a true Need for speed faithful have brought every console nfs since the 1st underground ( for the exception of shift) I will most definitely be getting this but cant help but feel a little worried. I like the direction they were going with nfs Nitro with the break neck speed, graffiti, the customization, the art direction. I just feel the game could had used more tracks and more depth which is why I was hoping for a Nitro 2. I know hot pursuit wont just be a watered down port because a different team will be working on it so I wonder what direction their going will they use a previous engine or will it be build completely from the ground up.